Come along on a journey through the aquatic habitat of a forested wetland. Meet birds and bobcats, along with the beavers and beetles that call the soggy forest home. Kevin Kurtz continues his award-winning “A Day In” series, and once again delights readers with a rhythmic, nonfiction look into a typical day for the animals that live in this wet habitat. I'm always excited when Arbordale Publishing releases new books each season. 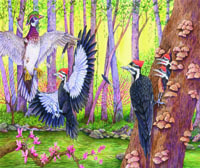 The company has recently released four new books, with A Day in a Forested Wetland being one of them. The definition for wetland is land consisting of marshes or swamp. 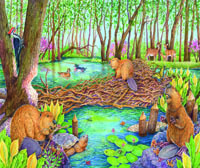 Certain animals live in forested wetland habitats, and A Day is a Forested Wetland is an engaging book for children to discover what might go in in a forested wetland on a particular day. Told in rhythmic form, this book is illustrated with brown bats, bobcats, beetles and other wetland creatures. The "For Creative Minds" section that appears after the story further teaches and educates with Beaver Dam Forested Wetland Sequencing, information on beavers and how they can change their environment, talk about the four main types of wetlands, and a large picture of wetland creatures with interesting facts. A Day in a Forested Wetland is a Fall 2018 release by Arbordale Publishing. 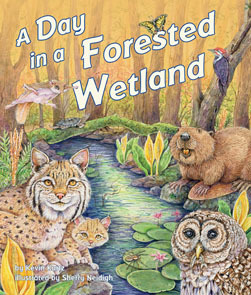 One person will win A Day in a Forested Wetland children's book. I received product for review from Arbordale Publishing. The opinions within this post are of my own and I was not influenced in any way. Please do your own research before purchasing products or using services. Your opinions and results may differ. I like the birds that live around our home area. I love monkeys. However my son who would love this book loves all animals . I like big cats like tigers, lions, cougars, etc. One of my favorite species of animals is pigs...in any way shape and form. I think penguins are the cutest little creatures. "Leave a comment on this blog post with one of your favorite species of animals." I like sea otters--they're playful, cute, and inquisitive! I like tigers and sparrows. Pigs and elephants are my favorites! I love cats of every variety. Animals in general are amazing! One of my favorite species of animals are wild cats! They are awesome. Animals are all so glorious! I like learning about and watching dolphins. Goats are one of my favorites. I love cats, big and small. My favorite species is the elephant. They are so intelligent and social. I like all kinds of ducks. Dolphins are my favorite animals. I love giraffes! They are so unique, and seem so graceful to me! My favorite species of animal is the dog.